Purchased in the summer of 2014 in Vancouver. This moto-styled bike was sold at The Bay (Hudson's Bay Company) under its Baycrest brand. Nearly all parts are original. In photo, cottered cranks have been replaced with longer ones. Pedals also have been replaced by seller. Still have original chainring and cranks. Of the front fender, only shards remain. The identification of the frame is a best guess. Similar examples have been identified as Hiawatha frames but in Canada many of these types of bikes were made by Victoria-Precision in Montreal. Ruling out Hiawatha entirely may not be possible. Recently discovered was a small "H" stamped into the left sissy bar gusset. Also of interest, each drop out had different serial numbers. The left has 00168. The right has TH7812. Padded seat with rivet tacks in surprisingly good condition. The headtube badge is 7.5 cm tall. 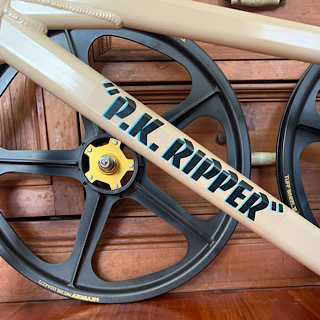 The seattube decal is 11.6 cm. Wow, talk about an authentic backdrop! Cool bike!